BC Local News is reporting that "Police are investigating a shooting in Guildford that happened Monday night. 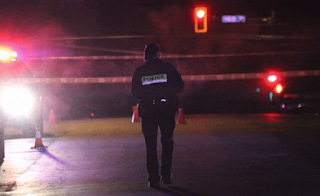 Surrey RCMP say they responded to reports of shots fired in the 15900-block of 101A Avenue just before 9:30 p.m. Although no victims were found, police say two people were seen running from the area, and an unknown vehicle was heard driving away at a high rate of speed." Two people running away. No kidding. Shots fired. No one hit. Two civilians ran away from the scene. Most people would.